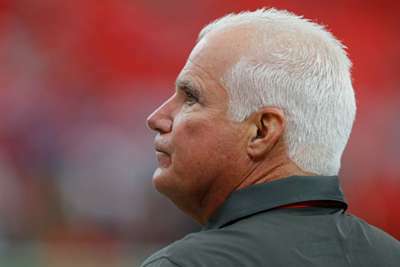 The Tampa Bay Buccaneers have fired defensive coordinator Mike Smith after their 34-29 loss to the Atlanta Falcons. Smith was the league's highest-paid defensive coordinator even though Tampa Bay's defense is ranked 31st in the NFL. He has been replaced by linebackers coach Mark Duffner. This season alone, the Bucs have allowed 34.6 points per game (a league-high) and 439.8 yards per game (second in the NFL). "I have the utmost respect for Mike Smith as a man and as a football coach," Buccaneers head coach Dirk Koetter said. "These decisions are always difficult, but our top priority here is to ensure that we do everything possible to help this team succeed. "As I have said in the past, the issues we have had as a team are never one person's fault. During good times, as well as the bad, it is a collective effort between the coaches and the players. "We all understand that this is a result-based profession and our results to this point have not met our standards. "I want to thank Mike for all the hard work and passion he has displayed here on a daily basis and I wish him well moving forward." After a strong 2-0 start, the Buccaneers have lost their last three games in a row.